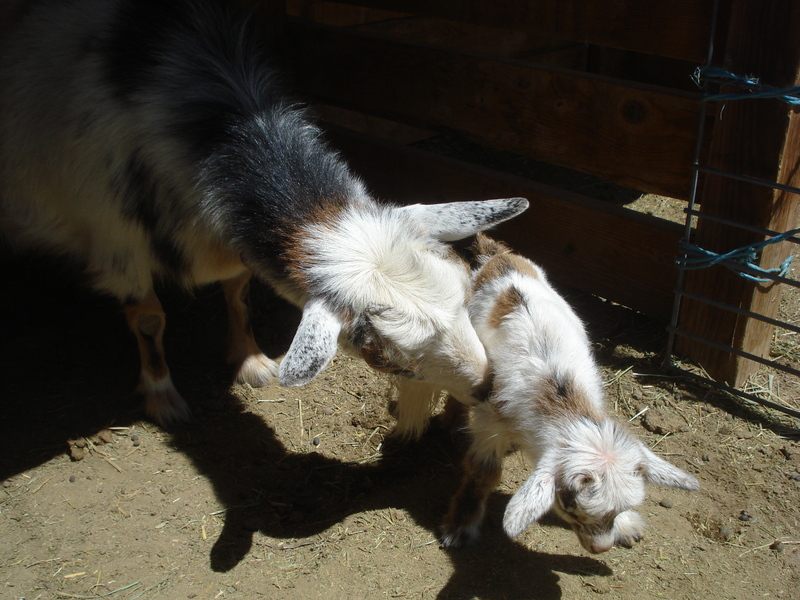 I had the mobile vet out on January 23rd to ultrasound two goats I hoped were bred. Spice, a 2013 daughter of Joey, had not been bred when I bred her twin, Nutmeg, and her dam, Joey, in February 2015 even though I had her in with the buck. Spice is the spitting image of Joey (who I lost last summer when her kids were three weeks old – another story for another day) and I really wanted to breed her, hoping she would be a good milker like her dam. So, when the vet said she thought Spice *might* be bred, but was very, very early on if so, I was pleased. The vet thought that Nougat, my half Nigerian / half Sable Sanaan, was not bred. Nougat last kidded in May 2014 and was gradually producing less and less milk so I really wanted her bred again so I could dry her off, knowing she’d be back in milk in a few months. As the vet said the fact Nougat had been in milk for so long might be a factor in getting her re-bred, I opted to go ahead and try to dry her off and put her back in with the buck, even though that left me with only one goat in milk. I calculated the date Spice was likely to kid (June 7), given the information from the vet and as she started bagging up a few weeks ago was comfortable that she was indeed bred. Thyme popped out a surprise kid last Friday but I thought I still had about a month to go with Spice. So when I went out this morning to feed and Spice was not interested, I was a little worried. I only know of two reasons a goat won’t eat – illness and labor. I hurriedly moved goats and set up a lambing jug and then moved Spice into a lambing jug. I went to check on her about 45 minutes later and found her cleaning off the second of two kids. Both are small but neither are premature so the vet was wrong on the dates. The buckling looks to be white/cream with tan on his neck and legs. He has a small umbilical hernia which will hopefully go away as he grows. The doeling is a buckskin with abundant white overlay. Despite their smaller sizes, both are up and nursing so I am hoping both will do well. Still waiting to see if Nougat did indeed get bred. I’ll re-breed Nutmeg when she comes back into heat in May and if Chai didn’t get herself knocked up, I’ll breed her in June. This entry was tagged Goats. Bookmark the permalink. yes, I love the frosting on the ears. The color genetics are fascinating. 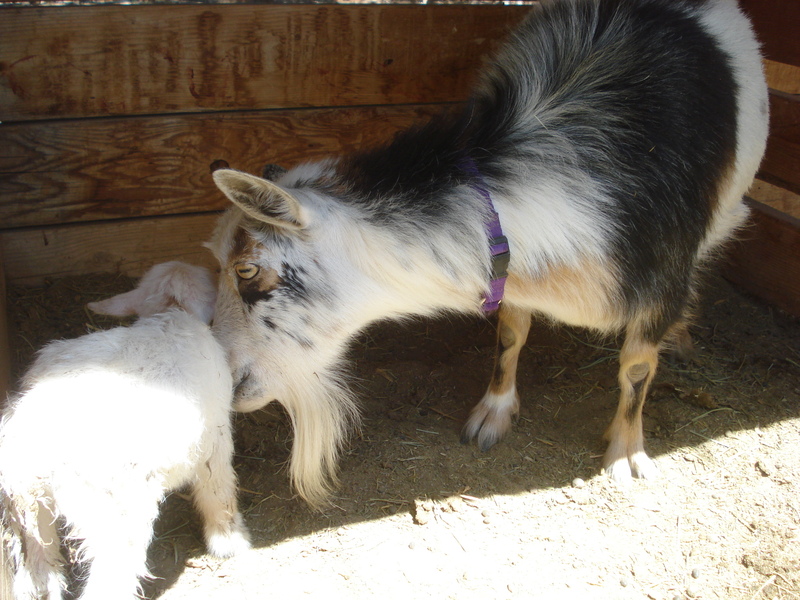 The buckling is colored very similar to the sire (Sunny Ray) and the doeling is a buckskin like Spice, with an overlay of white which masks most of the buckskin color and markings. Spice is a twin to Nutmeg who is a traditional buckskin with minimal white (but with frosting on her ears and muzzle). There is information on different colors / patterns on the web for Nigerians but I haven’t found much on the genetics and inheritance.